As an acclaimed multi-medium artist and designer Jules Hunt exhibits throughout Australia and sells her work internationally. She is constantly exploring and evolving the design, colour and form of her art across various mediums, creating a style that is unique and vibrant with a strong sense of composition, dimension and colour. Mediums include photography, ceramics, pottery, metal work, painting and textile design. With a background in Graphic Design and Photography having studied at UWS Sydney, she has evolved her style incorporating these skills to create her very unique artworks and designs. LightingDesign and creation of light fixtures throughout and outdoor wall mosaics. 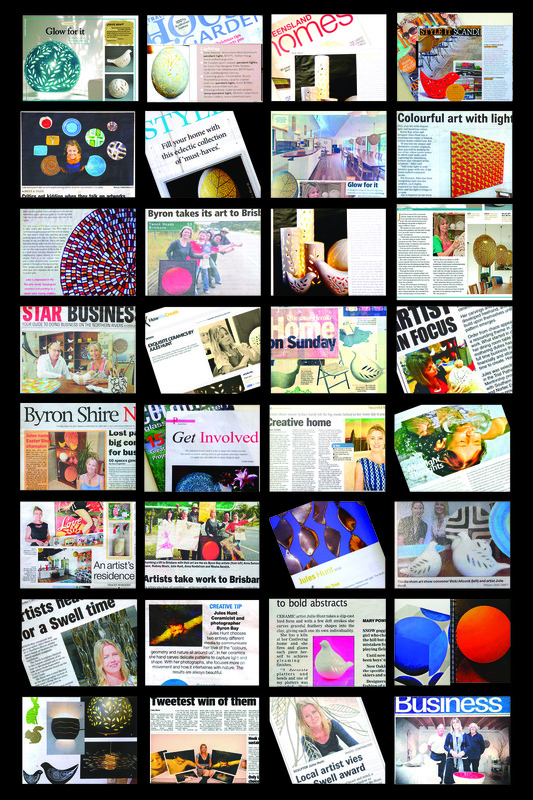 2010 Byron Shire News Front Cover!